After the SPLC contacted Neil Patel, co-founder with Tucker Carlson of the right-wing tabloid the Daily Caller, a Daily Caller News Foundation reporter will no longer be attending the upcoming conference of an SPLC-designated white nationalist hate group known as the H.L. Mencken Club. “We have a policy that all staff receive approval before accepting invitations to speak,” Patel said. “That policy was not followed in this case, and Richard [Pollock] will not be attending the H.L. 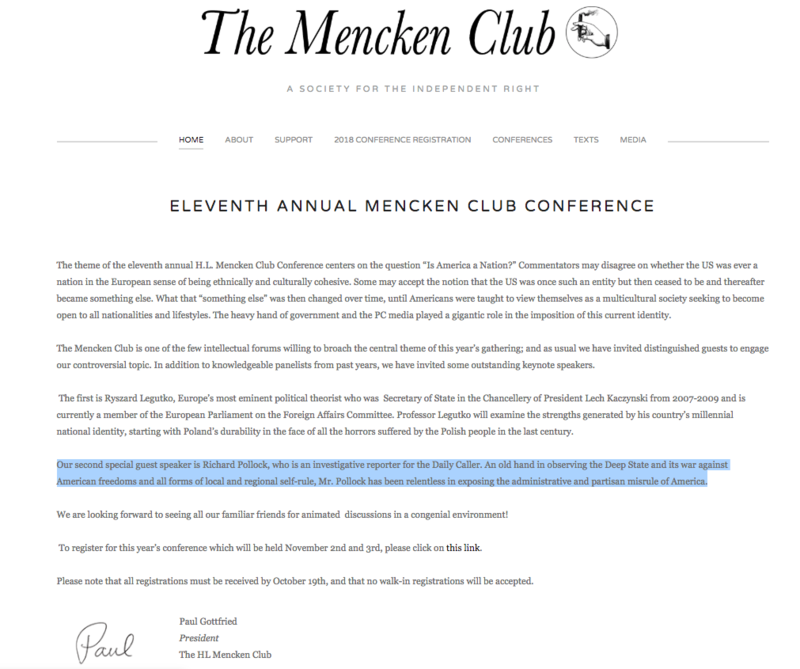 Mencken Club's event.” Pollock is a senior investigative reporter for the Daily Caller News Foundation and was billed as an “old hand in observing the Deep State and its war against American freedoms” on the H.L. Mencken website before it was scrubbed. Last month, Darren Beattie, a speechwriter for President Donald Trump, was forced to resign after CNN revealed he spoke at the 2016 H.L. Mencken Club conference. A screenshot of the website for the H.L. 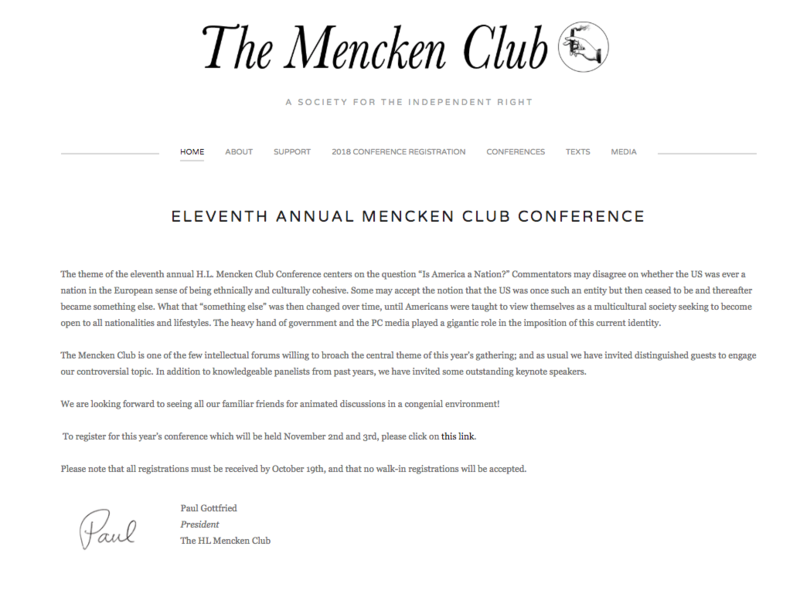 Mencken Club from August listing Richard Pollock as a special guest. Pollock’s name was removed after an inquiry to Pollock’s employer at the Daily Caller News Foundation. Pollock attended the gathering last November, which the SPLC highlighted in its report “The Daily Caller Has A White Nationalist Problem.” When asked if Pollock requested permission to attend in 2017, Patel said the Daily Caller didn’t institute its policy until this year. The H.L. Mencken club was founded by paleoconservative intellectual Paul Gottfried and the now infamous white nationalist Richard Spencer with money from William H. Regnery II, who served as the club’s original treasurer. Regnery is also the founder of two other white nationalist hate groups in the Spencer-run National Policy Institute and the Charles Martel Society. For ten years the club has catered to the suit-and-tie crowd of racist writers and activists who have long detested establishment conservatism for its embrace of neoconservative ideas and its failure to more explicitly court and advocate for the white voter. At the inaugural convening in 2008 — where American Enterprise Institute scholar Charles Murray, white nationalists Jared Taylor and Peter Brimelow, and two writers who would later be fired for racist commentary from the National Review John Derbyshire and Robert Weissberg spoke — Spencer gave a title to Gottfried’s talk “The Decline and Rise of the Alternative Right” and the name of a movement that would evolve into the racist “alt-right” made its debut. But Pollock’s attendance at the H.L. Mencken Club was not the publication’s only brush with alt-right institutions and ideas. Last week, The Atlantic revealed that former Daily Caller editor and columnist Scott Greer contributed to Spencer's racist journal Radix under a pseudonym while employed at the right-wing tabloid. “[T]he Jewish role in promoting the root causes of this problem through their support of mass immigration, multiculturalism, and hate speech laws that only go after Whites,” Greer wrote under the pseudonym Michael McGregor. The SPLC first highlighted Greer’s ties to young white nationalists last year. The report featuring Greer was published days after the deadly "Unite the Right" rally in Charlottesville last August following the Daily Caller’s decision to delete the contributions of Jason Kessler. Kessler, who organized the rally that left one dead and more than 30 injured, wrote several articles for the Daily Caller, including one that promoted the first torchlight rally in May 2017. In May, the Daily Caller was also exposed for publishing a prolific antisemite under the pseudonym Moses Apostaticus.